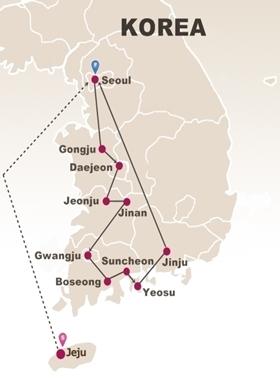 Western Korea, Seoul, and Jeju Island 10 day Tour. History and gorgeous scenery are the highlights of the Western Korea package. South Korea western cities boast a thousand years of rich history, including Seoul and Gongju city, where you can find many UNESCO World Heritage sites. The wide open land of Jeju Island is an exotic place where numerous horses graze. Cedar forest road was ranked as one of most beautiful roads for driving in Korea. Upon arrival at Incheon International Airport, you will meet our representative with name board at airport exit. We will assist you to board a pre-reserved vehicle and then transfer to hotel by a local driver on private basis. After check in, the rest of the day is free at leisure on your own. After breakfast, meet up with tour guide at hotel lobby. Visit Gwanghwamun Gate, the main gate founded by the first king of the Joseon Dynasty and enjoy the Royal Guard Changing Ceremony. Next, explore Gyeongbokgung Palace (Changdeokgung Palace on Tuesday), arguably the most beautiful and the grandest of all five palaces. Then pass by Blue house, also called Cheong Wa Dae, the presidential residence and stop by Gingseng shopping center. After lunch, head to Myeongdong, one of the busiest places in Seoul and among Korea's premier shopping destinations. We then explore Namsangol Hanok Village (Bukchon Hanok Village or Insadong on Monday) where there are five restored traditional Korean houses and a pavilion, a pond and a time capsule. Lastly, we will visit N Seoul Tower, offering panoramic views of Seoul and the surrounding areas. After the tour, you will be transferred to your hotel. After breakfast, meet tour guide at hotel. Leave for Gongju the ancient capital of Baekje Kingdom. Experience the tea ceremony with a Buddhist monk at Magoksa Temple, a representative temple surrounded by a mountain and rivers in Chungcheongnam-do Province. Then continue to Gongsanseong Fortress, a mountain castle which was established during the Baekje Period and you will enjoy archery experience there. Transfer to Daejeon. After dinner, check in hotel and the remainder of the day is at leisure. After breakfast, leave for Jeonju and visit Jeonju Hanok Village with over 800 traditional Korea houses. After Jeonju Bibimbab lunch at local restaurant, visit Tapsa Temple in Jinan, famous for the over 80 stone pagodas built by Lee Gapyong, a retired scholar. Then leave for Gwangju for hotel check in. Then explore Suncheonman Bay Ecological Park, thickly covered with reeds taller than a full-grown man, and then stop by Yongsan Observatory to see the bay"s beautiful view. After dinner, check in hotel and the rest of day is free at leisure. After breakfast, take Yeosu Cable Car offering the safe yet thrilling experience with the gondola to travelling over the sea. Enjoy the scenery of downtown Yeosu and the archipelago around the old seaport. After breakfast, free till to meet a local driver and transfer to Gimpo Airport for your flight to Jeju Island. Upon arrival at Jeju International Airport, you will be met and transferred to hotel by a local driver. After check in, the rest of day is free at leisure on your own. After breakfast, meet your guide in the lobby of the hotel. During this full-day tour you will visit and learn things about Jeju Island that you never knew about before and will be able to get-away from the hustle and bustle of Seoul and enjoy picture like views and get some fresh air! Your guide will pick up you at your hotel lobby in Jeju Island between 8:30am-9:00am depending on your hotel location. Hop on a bus and head over to Gimnyeong Beach, one of must go to beaches in Jeju Island due to emerald colored beaches with charmingly decorated cafe. Then you will visit Manjanggul lava tube that stretches for as far as 7.4km which was formed when the lava that was deep in the ground spouted from the peak and flowed to the surface. There are rare animals such as bats living inside the tube. After having seasonal local lunch you will enjoy haenyeo performance. Haenyeo literally means "Sea-Women" and they are divers in Jeju Island who dive into the ocean to catch various seafood or oceanic organisms. Then continue on to visit Seongsan Sunrise Peak, designated by UNESCO as World NatureHeritage in 2007. Seongsan Sunrise Peak rose from under the sea in a volcanic eruption over 5,000 years ago. Located on the eastern end of the Jeju Island, there is a huge crater at the top of Sungsan Sunrise Peak. Afterwards you will visit Saryeoni forest path. On the eastern border of Mt. Halla National Park, this is a popular weekend walking destination with 15km of forest paths shaded by maples, oaks and cedars, with the occasional roaming deer. Finally, you will stop by a Daheeyeon. Daheeyeon is a green tea garden located on the eastern side of Jeju Island. Not only does it have a large field of green tea, you can also zip line, enjoy delicious green tea ice cream at the Cave Cafe and soak your feet in a nice foot bath for 30 mins. When the tour ends, we will transfer you back to your hotel and spend rest of the day at leisure. After breakfast, meet your guide who will pick you up from your hotel lobby before heading over to Eorimok trails, which are surrounded by the lush forest of Mt. Halla. Visit Olle and Yakchen Temple. After having a seasonal local lunch, then visit Jusangjeolliade, also called Seaside Cliff, a popular spot due to an impressive pillar rock formation along the coast of Jeju Island and is a designated cultural monument of Jeju Island. This cliff was also formed when the lava from Mt. Halla erupted in to the sea of Jungmun area. Then move on to the famous Dragon Head Shore situated at the bottom of Mt. Sanbang at the north of Jeju City. The locals call it "Yongduam" meaning "dragon head" in Korean due to its distinct shape similar to a dragon head. The Dragon Head Shore was created by strong winds and waves over thousands of years. In addition to scientific explanations, there are many other myths about the "dragon head" as well. One of the best-known myths is about a white horse that dreams of becoming a dragon and while it was ascending to the sky it was caught by a soldier and turned into this rock. If you are visiting during November through January, you will proceed to experience tangerine picking. Jeju Island's tangerines are known for its abundant nutrients and sweetness. If you are visiting during the month of February through October, you will visit the Spirited Garden which is famous for bonsai theme park. Finally, stop by Mysterious Road which is one of the must go to tourist spots in Jeju Island. Here an optical illusion makes it appear to be sloping upwards when in fact it runs downhill! When the tour ends, we will transfer you to Jeju International Airport with your tour guide for taking a flight back to Seoul. Upon arrival at Gimpo Airport, you will be met and transferred to hotel by a local driver. After check in, the rest of day is free at leisure on your own. After breakfast, you have free time until a local driver arrives to transfer you to Incheon International Airport for your flight home. US$ 2250 per person- based on 2 sharing a room and airport transfers.